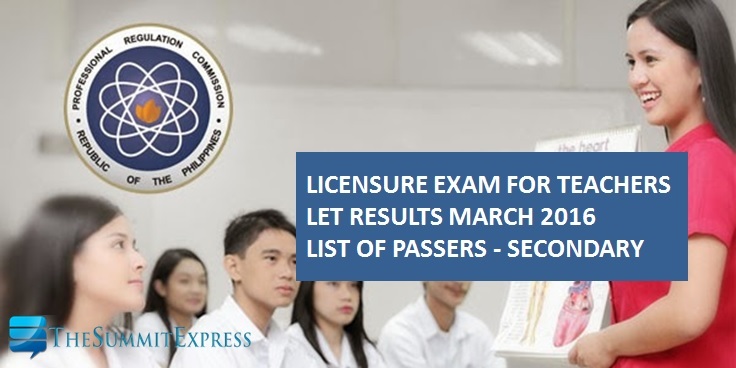 The Professional Regulation Commission (PRC) announced the alphabetical list of passers for the March 2016 Teachers board exam or licensure exam for teachers (LET) - Secondary level on May 19, 2016 or 41 working days after the exam. Congratulations to all passers! LET results out on May 19. PRC said that 18,810 secondary teachers out of 53,090 examinees (35.43%) successfully passed the Licensure Examination for Teachers (L.E.T.). The full list of passers or those who have successfully hurdled the tests will be posted on this page. Below will list be activated once LET results are announced online. PRC administered the LET board exam on March 20, 2016 in at least 20 testing centers around the country: NCR (Manila), Baguio City, Cagayan de Oro (CDO) City, Cebu City, Davao City, Laoag City, Legazpi City, Albay, Lucena City, Quezon, Pagadian City, Zamboanga Del Sur, Rosales, Pangasinan, Tuguegarao, Masbate City, Antique, Bacolod, Iloilo, Catarman, Jolo, Sulu, Tacloban, Tawi-tawi, Zamboanga, Occidental Mindoro, Oriental Mindoro, Palawan, Romblon. Based from PRC Resolution No. 2014-874, the target release date of March 2016 LET results is on Monday, May 16, 2016 or in 38 working days after the exam. PRC Board News, our partner website for PRC exam results said that the results of the recent LET exam will be out online the least on May 20 (Friday). A total of 61 calendar days or about 2 months was calculated. Dr. Carl Balita, a reliable source hinted that results will be released within 5 working days from posting. "The LET result is in YOUR hand! The dream and the dreamer will be one!," the 'ultimate reviewer' of CBRC shared on Facebook. On May 11, Balita posted: "In what seems like an infinity of sunrises dawns a lifetime privilege of mentors listed in the archieve of professionals and where the dream and the dreamer is ONE..." Netizens guessed that infinity shape hints of number '8' and the sunrises means the total number of days since the riddle was posted. With this, possible exact release of LET results is on May 19. UPDATE: Early Wednesday, Balita posted that "sometimes things happen earlier than we expect." The photo has this text: "This is the day the Lord has made." It means that LET results are most probably be released anytime today, May 18. UPDATE 2: Today (May 19) is the BIG DAY for LET takers!